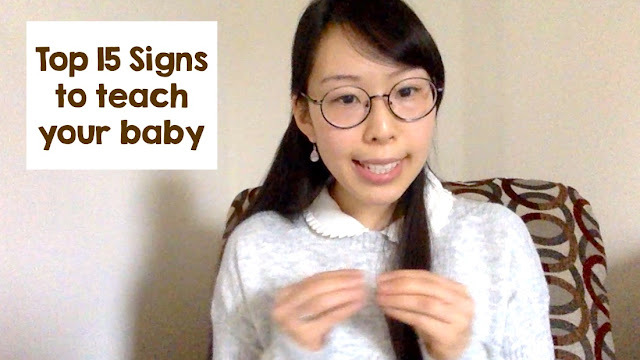 In the video below, I will go through my selection of top 15 signs to teach and use with babies. Communicating with your baby is critical for his or her cognitive and language development. Sign language is a way for little ones to learn how to communicate before they are able to use verbal speech! Why teach a baby signs? Typically, babies develop their receptive language, or understanding skills, far before they are able to use verbal speech to communicate. Most babies say their first word around 12 months of age. If babies learn signs, they might be able to use signs to communicate their wants and needs. Think about how powerful that would be for baby, to be able to use language to express, to ask for something, and to interact with Mom and Dad. Teaching a baby signs can really help the baby learn that language is so important – such an important tool – to change the environment around them or to connect with others. When can I teach my baby signs? Some babies can learn simple signs as young as 6 months of age. At six months, a baby might not have the fine motor coordination or hand control to be able to sign back to you until he or she is about 8 or 9 months of age, but you can start teaching signs to your baby when you think that your baby’s ready – even if your baby can’t sign back yet! Remember, babies typically take time to build up their understanding skills prior to expressing. How do I teach signs? Teach and re-teach! Be repetitive and be consistent! Put signs into your daily routine and in everyday activities. The signs I’ll be showing you are very functional, high-frequency words that you’ll be sure to encounter and use on a regular basis. What if the sign is too difficult for my baby's fingers/hands? One thing I mentioned earlier is how a baby might not have some difficulty with making signs, putting their hands or fingers into a certain shape. Signing does take quite a bit of fine motor coordination! So, please know that it’s totally okay to use a replacement, or what is commonly referred to as “sign approximations”. Watch the video for an example of how the sign for "more" can be made into an approximation. The important part of using sign approximations is to be consistent. For example, if clapping hands together for the sign "more" is what will physically work for your baby, this is how you should be signing as well.